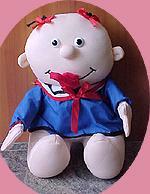 Item Description This sweet little brat in blue is waiting to convey your emotions to your beloved one, send him and delight them. Item Description Amazing looking Dino in light blue comes with a cute bow and a message of Hug Me on its back, measures about 10" x 12". Item Description Amazingly furry Puppy in light pastel colours comes with a cute bow, measures about 10" x 10". 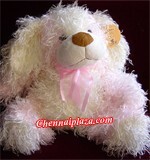 Item Description Very sweet looking and very soft puppy from Russ Berie in baby pink colour will definitely charm it's recipient.